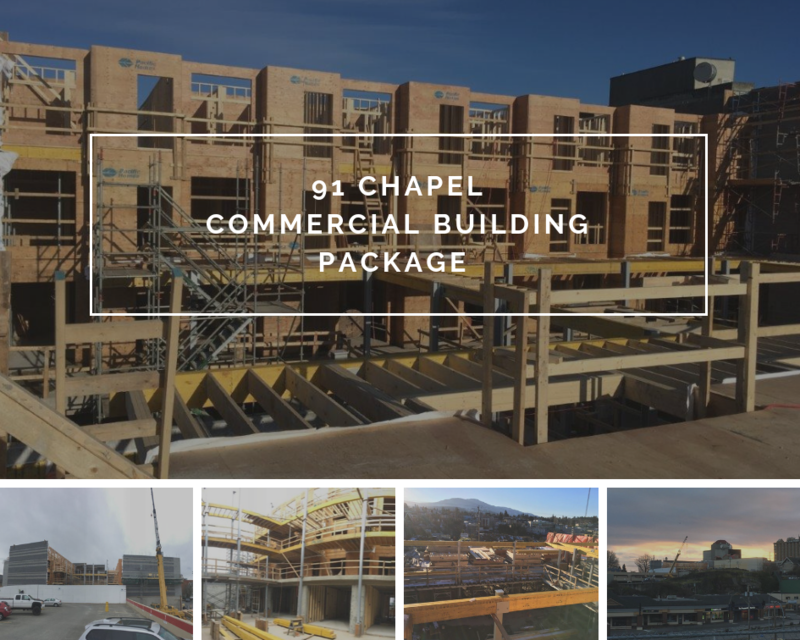 91 Chapel a new condo development in the heart of downtown Nanaimo, BC on Vancouver Island. The project is being developed by Island Creek Developments and constructed by Island West Coast Developments. Pacific Homes has been a proud supplier of the commercial building package. Designed by de Hoog & Kierulf Architects, this project is poised in the historic downtown of Nanaimo, BC and the building offers a west coast contemporary design. The vision was to develop a residential project that offers a unique and affordable living space within the urban setting of downtown Nanaimo, BC. A selection of one and two-bedroom condos offer some delightful living spaces. It is designed to every small detail using the warmth of natural wood and the cool urban feel of concrete. Starting back in February, Pacific Homes began shipping engineered and prefabricated floors, walls and trusses from our production facilities in Cobble Hill, BC to the build site in downtown Nanaimo. After a couple of months, the structure is close to being erected with the use of our prefab commercial building package. The building site has amazing views of the Georgia Strait and Mount Benson. There are many unique local restaurants and cafes a short walk away. We are excited to see the progress over the next couple of months. Interested In Learning More About Our Commercial Building Packages?